I remember in 1986 going to the Beverly-Begg Observatory, in Dunedin, to see Halley’s Comet. At the time, I was a young kid fascinated with astronomy. I had discovered a book on the topic the previous year while on holiday in Central Otago, and soon joined an astronomy club. Through the club, I built a basic telescope (with a lot of help) and dreamed of becoming an astronaut. But this dream was short-lived and that career never eventuated. Instead, I became a hydrologist. Edmond Halley (1656-1742), after whom the comet is named, is best known for his role in astronomy. But of his 107 or so published papers, only 36% were on the topic. 34% of them were on geophysics, a few of which covered the water cycle and in turn helped usher in a fundamentally new approach to hydrology. It’s likely that Halley became interested in the water cycle after reading a book by France’s Edme Mariotte, published in 1686. Mariotte argued, with the support of experimental measurements, that rainfall is sufficient to supply the flow of water in rivers. (You think this is obvious? It wasn’t at the time.) But Halley then wondered: Is evaporation sufficient to supply rainfall? After a basic lab experiment and a back-of-the-envelope calculation, Halley believed it was indeed sufficient. And in doing so he completed the water cycle: rainfall feeds rivers; rivers flow into the oceans; oceans evaporate into water vapour; and water vapour condenses into rainfall. The fundamentally new approach to hydrology, then, was the quantitative measurement of the water cycle. Halley shares the honour of ushering in this revolution with Mariotte and a second Frenchman, Pierre Perrault. It arguably remains the most important element of hydrology to this day. Halley’s sortie into hydrology didn’t last long, though. He published only four papers on the topic, the most important in 1687 and 1691, and never put his other interests on hold, hence his fame in astronomy. Yet among historians of hydrology, Halley’s contributions on the water cycle are very much appreciated. Dooge J.C.I. 1974. The development of hydrological concepts in Britain and Ireland between 1674 and 1874. Hydrol. Sci. Bull., 19(3): 279-302. Malin S.R.C. 1993. 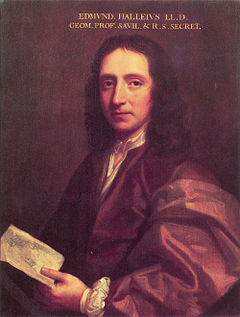 Edmund Halley — geophysicist. Q. J. R. astr. Soc., 34: 151-155.